Not all plants are created equal and Tillandsia dyeriana is one that is just a standout. Rare and endangered in its natural habitat it grows in the mangrove swamps of Ecuador. This is a terrestrial plant which is a little different to most Tillandsia and yes it likes to grow in a container. The foliage is nothing special however with hanging feather like flowers, brilliant in colour it is a spectacular addition to any plant collection. Flowers are around 35cm long and 5cm across, rising on a tall stem from the somewhat lacklustre foliage, but with flowers like that Tillandsia dyeriana does not rely on its foliage for good looks. 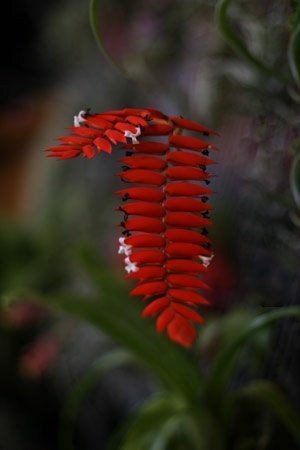 As you can guess from the natural habitat Tillandsia dyeriana requires a warm humid environment. It certainly does not like frosts and can do with a little fertilizer in a diluted form in spring and again in early summer. A little more difficult to grow than Tillandsia cyanea which is also easier to find for sale. Try a orchid potting mix, moist but not wet, use water that free from chemicals, preferably rain water.